I decided to call it a day and close her up. She's fully functional and sounds right. Time to make some music! I really like your combination of colors. The woodwork also looks like a perfect job. Thank you for the kind works. Pretty happy with the woodwork myself. It says a lot about the ingenuity of the original mini front panel design to see it work so well in negative colors. This is just inkjet paper on acrylic, it was much cheaper to do it this way, and print black on white, than to get a metal custom panel made. 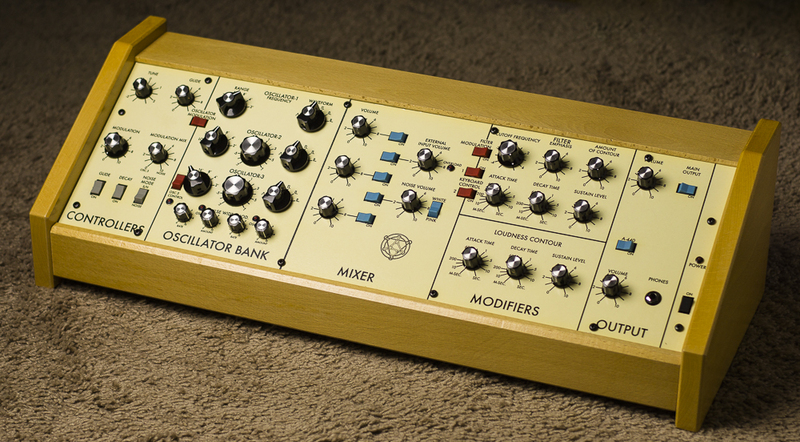 If I ever do decide to get one (and buy the right size knobs...) I'll still go for this color scheme, cause I love it.